Not as catchy as Death and Taxes, or Love and Marriage – but they go together like a horse and carriage. In fact, novelists swarm to politics and corruption like moths to flames. Staring into that flickering fire is former Olympian, Ron Barak, who is about to publish a novel, The Amendment Killer. Barak was a member of the US Men’s Gymnastics team at the 1964 Tokyo Olympics. And while he was also an NCAA champion with the gymnastics team at the University of Southern California, his studies at USC were arguably more critical to his long-term career: a BS in physics and a Juris Doctor of Law. Barak became a lawyer in the 1970s, among other things, representing athletes as their agent, including football greats Bubba Smith and Ahmad Rashad. Most of Barak’s career was devoted to real estate law, and witnessed first-hand the rise of Japan’s economic influence in the 1980s when the yen overpowered the dollar and Japanese corporations bought up landmark properties and brands overseas. Barak’s latest political thriller, The Amendment Killer, hits bookstores in November. Let’s ask Barak a few questions about the book and the journey to his third career (writing following sports first and law second). Modern day Washington, D.C, misconduct on the part of our political representatives has never been worse. In this backdrop, frustrated citizens form a tax-exempt watchdog foundation, The National Organization For Political Integrity (NoPoli), to remind our governmental leaders that they are there to serve, not to be served. In short order, the membership ranks of NoPoli swells to hundreds of thousands of Americans disgusted by our abhorrent government. NoPoli sponsors and convenes a Constitutional Convention at which a 28th Amendment to the Constitution is adopted to criminalize political abuse and corruption. Offended by the sudden demise of their many perks and the threat of incarceration, Congress challenges the Amendment and asks the U.S. Supreme Court to invalidate it on an expedited basis. Because of the fundamental importance of the Amendment, the Supreme Court agrees to hear and decide the case in one televised week. As the nine justices take the bench to hear oral argument, the justice expected to cast the deciding vote, Arnold Hirschfeld, receives a text that begins “We have your granddaughter. Here’s what you need to do.” Hirschfeld is warned that his granddaughter will be killed by the end of the one week expedited process if the Amendment is not defeated by the Court—or if word even gets out that his granddaughter is being held to control the outcome of the case. What is the relevance of your novel to today? First, the novel is particularly timely (“ripped from the headlines” some might say), addressing our highly dysfunctional U.S. government. It does this through my hypothetical 28th Amendment to the U.S. Constitution criminalizing abuse and corruption on the part of our political representatives, which Congress asks the Supreme Court to invalidate. Using my legal background, as well as my political knowledge, I actually drafted such an amendment on my website. Second, I introduced diabetes into the novel because, like my young protagonist, Cassie, 30 million Americans today are diabetic. That’s one in ten Americans. That’s epidemic and another highly relevant issue today. Third, there are serious ethical issues in the story. Cassie’s grandfather, the Supreme Court justice holding the swing vote in the case, must decide whether he can sacrifice the best interests of the country, and his duty as a Supreme Court justice, to save his granddaughter’s life. Are the best interests of the country worth his young granddaughter’s life? Tell me about the character Cassie and why you wanted to create a character who has diabetes? Part of the reason is that I wanted to draw attention to a disease that is at epidemic levels in the country (and the world) today. It is a subject I know well because I’m diabetic. My wife, Barbie, and I have also committed 50% of the proceeds of The Amendment Killer to diabetes research and education. There are millions in the world today who are diabetic but don’t know it—until it is too late for them. That’s tragic because diabetes can be intelligently well managed today. We have Olympic gold medalists who are diabetic. We have NFL and NBA athletes who are diabetic. Diabetes, if well managed, does not at all have to be a death sentence. Several prominent national diabetes organizations are solidly behind The Amendment Killer because they think Cassie is a poster child for diabetic youngsters. 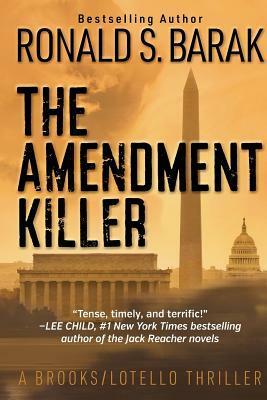 And The Amendment Killer is coming out in November, which is National Diabetes Month! What inspired you to become a novelist? Were there indications as a youth that you had a storytelling gene? I wrote my first novel on a dare from some friends. Being somewhat competitive, a trait perhaps attributed to my gymnastics days, I couldn’t turn my back on the challenge. As I wrote that first novel, I discovered that I loved it. I’ve worked hard ever since to learn how to write properly so that I could develop and continue this new pursuit. Some have commented that I simply transitioned from physical gymnastics to mental gymnastics. I don’t know about that, but writing is definitely easier on the joints than physical gymnastics, especially at my age today. I don’t know if I had a storytelling gene, but I actually might have. As a little kid, my dad used to tell stories to my younger brother and me. He had an incredible imagination and a genuine patience in his storytelling. Maybe some of that rubbed off on me because I have discovered how much fun I find it to weave a story. It presents an opportunity to create mystery but to inject humor at the same time. That’s a mix I really enjoy. What writers have inspired you? Why? The list is long. I love to read and have for years. I read mostly fiction, but I do occasionally read some non-fiction too. I read to be entertained. Perhaps that’s why I write to entertain. Examples in no particular order are Ian Fleming (James Bond novels, I’ve read every one), John Grisham (I’ve read probably about half of his), Michael Connelly (I’ve read most of his), Lee Child (Jack Reacher novels, I’ve read most of them), Daniel Silva (I’ve read most of his), David Baldacci (I’ve read most of his), Vince Flynn (read most of his too), Robert North Patterson (read most of his), Scott Turow (I’ve read most of his), John Lescroart (I’ve read most of his), Greg Isles (I’ve read most of his). I have also read a lot of Stephen King. And I’ve read a miscellany of lesser known novelists. I’m sure I’ve missed some. As for why, these authors have a few things in common: most of all, they can tell a great story. Beyond that, they keep you guessing and turning the pages. How has being a 1964 Tokyo Olympian impacted your career? In countless ways. First, training brought discipline and commitment into my life at a young age, when I didn’t otherwise exhibit much of that and neither did my friends. Second, it was an absolute joy. Third, it provided great education; I got to travel around the world, and I learned how to handle celebrity, not to let it get out of proportion. Fourth, it was a great source of self-confidence and self-esteem; it helped me know that if I put my mind to something, and worked hard at it, I could usually accomplish it. Fifth, along the way, it has opened doors that might not otherwise have opened. (Note: I used numbers here, but I am not prioritizing these things and don’t think I could.) So, in terms of my career, while I was at the near top of my law school class, my Olympic career got me more job offers than might otherwise have been the case, a combination of the celebrity and the maturity and people skills. It didn’t make me a better lawyer, but strong work habits learned in sport probably did. Stay tuned for the November 1 launch of The Amendment Killer! Posted in Geo-politics, Gymnastics, Olympics, Tokyo 1964 and tagged 1964 Tokyo Olympics, novel, ron barak, The Amendment Killer. Bookmark the permalink.